Norwegian Cruise Line has revealed the hull artwork for the Norwegian Joy. The artwork which will be painted on the ship’s hull is being designed by renowned Chinese artist Tan Ping. 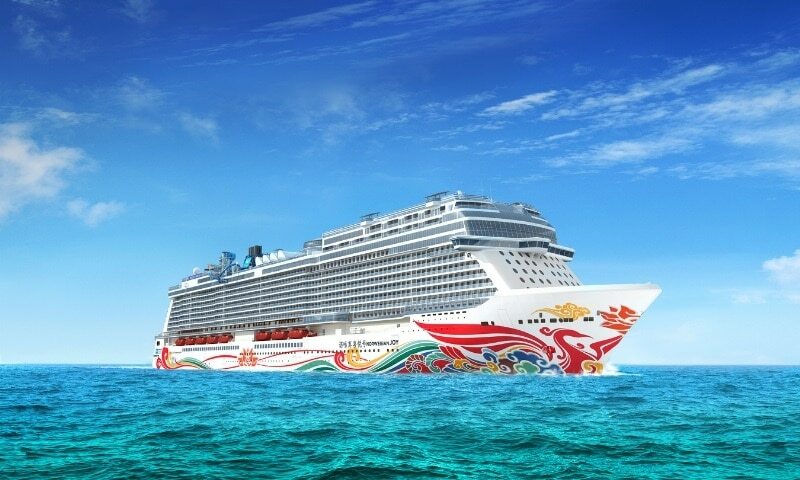 The Norwegian Joy will be based out of Shanghai and Beijing when it makes its debut in Summer 2017. The designed artwork will reflect the ships Chinese deployment. The design called “Phoenix” which Tan Ping will be putting together is an iconic mythical bird believed to reign supreme over all birds of the world. It is a ubiquitous motif in Chinese art and can be found throughout the centuries in paintings, silk brocades, architectural flourishes, and more. As you can see in the rendering featured above the artwork is dominated by red and yellow, both traditional colors for China. Red signifies joy, a perfect match for a ship of the very same name. Yellow represents grandeur, the feeling that a ship of this size evokes in those who see it. The design also includes hints of blue, signifying the sea. Adding hull artwork to a cruise ship is a detailed and long task. You can watch a video of the Norwegian Escapes hull artwork being done which actually won “Best Ship Hull Artwork” in Cruise Hive’s 2015 Cruise Ship Awards. Norwegian Joy is being purpose-built for the Chinese market and is currently under construction at the Meyer Werft shipyard in Papenburg, Germany. The ship will be carrying 3,850 passengers and feature the much-anticipated first race track at sea. Let us know in the comments further down below what you think of the new hull artwork for Norwegian Joy.